The Carlton Gardens Tennis Club is one of Melbourne’s oldest and most charming tennis clubs, situated in the Royal Carlton Gardens within walking distance to the CBD. The club has four LED-floodlit artificial-grass courts, under towering elm and oak trees. The heritage clubhouse has been fully renovated with change rooms, kitchen and a BBQ area. The courts are open to the public via the convenient book-a-court system. Facebook, search Carlton Gardens Tennis Club and like our page. We have an on-line booking system that is quick and easy for all players to use. Click here -> Court Hire. 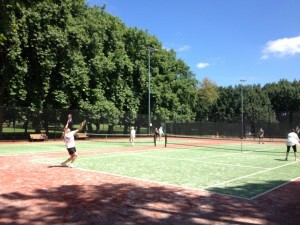 The cornerstone of the Club is its very popular organised tennis program. These social competition sessions are held throughout the week, they cater for all levels of tennis, are open to members and non-members and are a good way to introduce yourself to the Club. Daytime – mornings from 9-11 am. Social tennis (male and female) and not highly competitive. Intermediate level. It’s a “just turn up” session. Members and non-members welcome. $5 a session. If interested call Margie on 0417106228 or Sonia 0419335695. Evening – 6.00 to 7.20 pm – mixed and non-mixed social doubles – no booking needed. This is a Fast-4 format – a lively free tennis session for intermediate (and above) players – ask for Tom or Ben. Daytime: 9-11 am: Looking for players for Thursday mornings. This is a social tennis session (male and female) and is not highly competitive (intermediate level.) It’s a “just turn up” session. Members and nonmembers welcome. $5 a session. If interested call Margie on 0417106228 or Sonia 0419335695. Weekly Thursday night session: Thursdays 6.00-7.30-pm. ‘Women’s only’ participation night. Specifically for women that have never or have rarely played tennis before, this session is open to all women, both members and non-members alike. A social session that is run solely by female CGTC members and who will be on hand to organise matches and provide a few basic tips to those starting out. This is a free session where racquets and balls are provided thanks to our friends at VicHealth and #thisgirlcan. No bookings needed. Please wear white or light color sports shoes. New balls provided by CGTC. Members $5 / Non-members $10, paid on the night (Bring cash) Every Friday (unless notified otherwise due to weather on our Facebook page: https://bit.ly/2RP8OI9 ). From 9 am – Mixed and non-mixed doubles for CGTC members. Sunday afternoon ‘Fast -4′ tennis – beginner-level session. Sunday afternoon is a social session of tennis in the fun ‘Fast-4’ style, ideal for those who are new to tennis or returning after a break. This is an ideal session for beginners to attend. Balls are provided and there is a supervisor to welcome new players and open the club-house. From 2 pm to 4 pm every Sunday. $5 per player. (Ask for Sim on arrival at the courts.) Player numbers of this new session are varied so please bring a friend and enjoy some fun times on court. 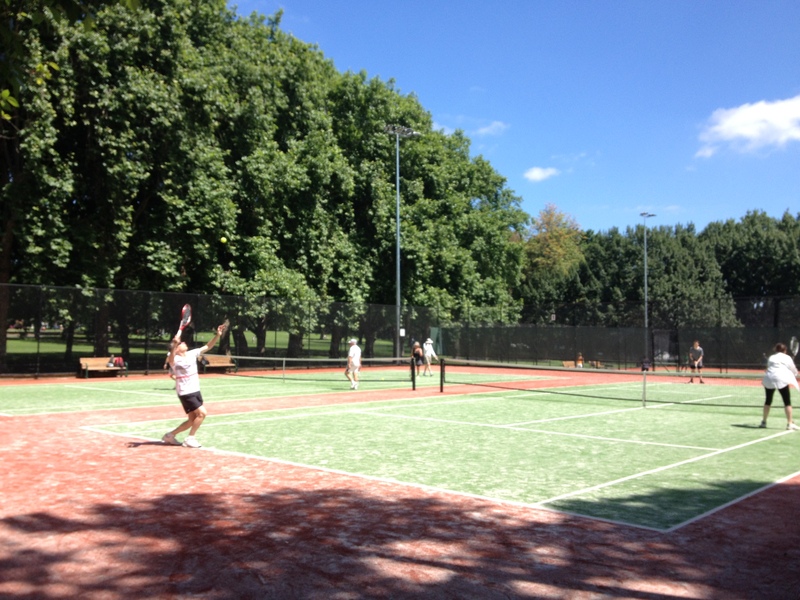 The tennis courts and social areas of CGTC are available to hire for tennis-related functions and events. (b) court hire costs based on the number of courts booked (1-4 courts) and the length of booking time. The club-house contains a kitchen, seating for up to 20 people, and male & female bathrooms & change rooms. Monday Women’s Training Squad. Gay players, intermediate and above.